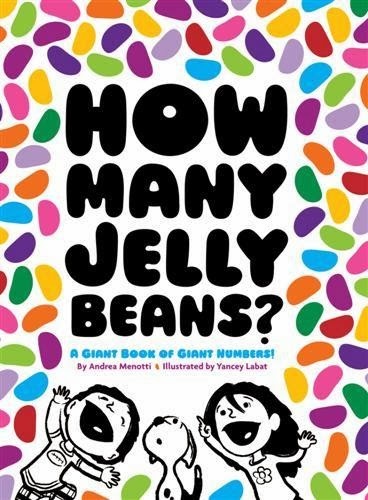 Home » Numbers » Reviews » Reviews by Tania » Tania McCartney » Toddlers » Review: How Many Jelly Beans? Review: How Many Jelly Beans? Jelly beans? Who doesn't love them? 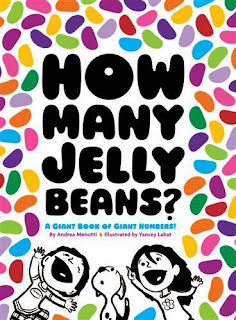 If you're after a sure-fire way to have your tots counting up a storm (and I mean counting) jelly beans are it, and this large format riot of a book delivers many a bean-shaped lolly for sheer counting pleasure. Featuring a fete of gorgeous colour, superbly offset with stark black and white page elements, we follow two kids and their dog as they begin bragging about how many jellybeans they can scoff in one sitting. Trust me when I say it's an impressive amount. Of course, as is the way with kids, the exaggerating soon gets out of hand (fun!) and we're soon hitting the thousands, but the glorious thing about this book is that you will literally find thousands of beans. Maybe even many thousands--and dare I say things could even hit one million?! But honestly, how could an illustrator fit one million jelly beans in a book? Thank goodness for large formats and fold-out pages! This is an original, truly celebratory and fantastically fun counting book for kids of many ages, and the design elements are a joy for adults. How Many Jelly Beans? is packed with so much childlike energy, no added sugar is necessary. Title: How Many Jelly Beans?